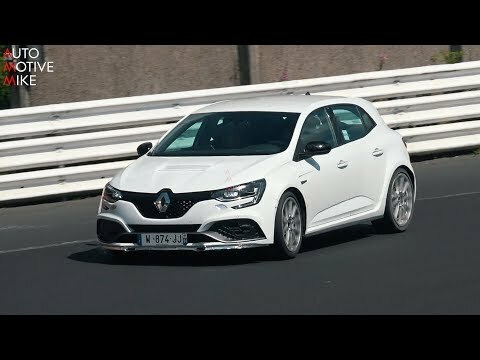 Having the Nurburgring lap record is the hot hatch version of a wrestling belt. Whichever car is fastest around the fearsome circuit is, essentially, the best. So with that in mind, Renault looks like it’s ready to go for the crown with the upcoming fast Megane. Although nothing is confirmed yet, this car seems to be a prototype version of the Renault Megane RS Trophy. It doesn’t stand out with flat white paint and the Renaultsport badges taken off, but the sensors attached to the wheels suggest engineers are making tweaks to go faster. Many – us included – thought Renault would have gone for the Nurburgring lap record before now. The Megane RS was first revealed at the Frankfurt Motor Show in September 2017, five months after a Honda Civic Type R set the current 7 minute 43.8 second benchmark. Clearly Renault was working on the Trophy version, which is more likely to go for the record. The Trophy model packs 300hp, mainly due to turbo and exhaust changes. That’s 25hp more than the standard Megane RS, and enough to ensure that it’s the most powerful Renaultsport model ever created. Sticky tyres and upgraded brakes are added to the recipe, while the four-wheel-steering setup (unique in a hot hatchback) adds extra agility at low speed and stability at high speed. Despite the Civic Type R having almost 20hp more than the Megane RS, both hit 0-62mph in 5.7 seconds.